Coastal kayak anglers eagerly anticipate a ‘Cajun sleigh ride,’ the nickname given for a freshly-hooked redfish that takes off and hauls ‘yak and fisherman on a fun, line-peeling, drag-screaming journey. 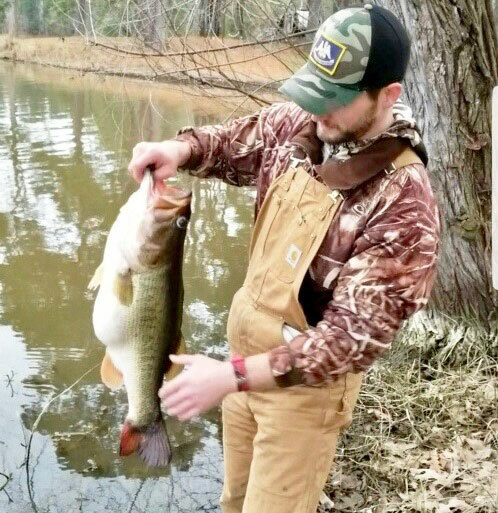 Even though he was pretty far from South Louisiana, Jared Sattler got a Cajun sleigh ride of his own up in Desoto Parish on Saturday afternoon — but it obviously wasn’t a redfish doing the pulling. 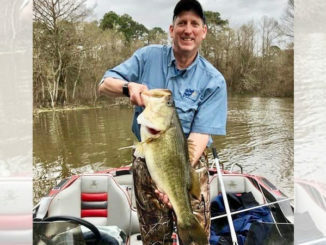 Sattler was fishing in a 12-foot Water Moccasin pirogue when he set the hook on a whopping 11.41-pound lunker largemouth bass on the north end of Toledo Bend. He and his dad, Ray, had departed from Circle Drive Landing around 9 a.m. in two pirogues — and it was pretty slow going for a while. 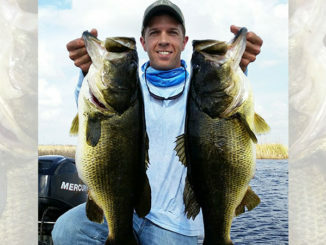 “We put the boats in the water and it started raining, so we got back in the truck for a few minutes and finally decided we weren’t going to wait the rain off so we just started fishing — and man, we didn’t have a bite til about 12 o’clock,” he said. “I was throwing the kitchen sink at ‘em, and I couldn’t get a bite. 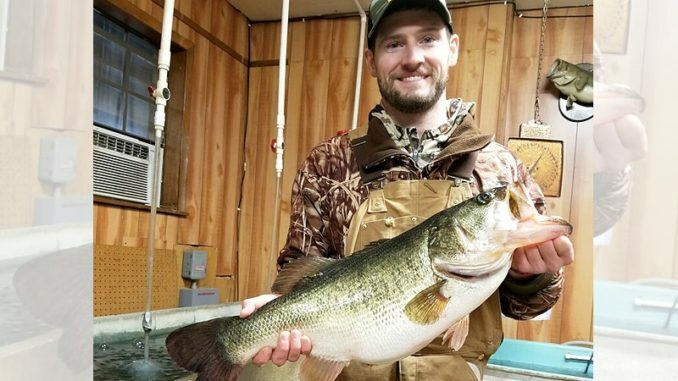 “I thought, ‘You know I can pitch and hit that tree real quick before I get too close to it.’ She nailed it as soon as it hit the water almost, and I set the hook and I felt like I hooked a stump — it just didn’t move,” Sattler said. “And it just kind of eased off with it, so I thought, ‘Alright, I’m going to get another good hook set to make sure I have it good.’ And I waited until it turned away from me to set against it, and when I did — all hell broke loose. 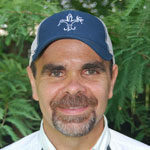 Finally, after what seemed like an eternity, the big fish wore down, and the 29-year-old Greenwood resident lipped it into the pirogue. “I was sitting there holding her just shaking uncontrollably, and I was like, ‘I have got to get this thing into the ice chest, because it was all I could do to hold on to it,’” he said. “She had the hook pretty deep down in her mouth, but I’ve never caught a fish so big that I could just reach my hand in and undo the hook. 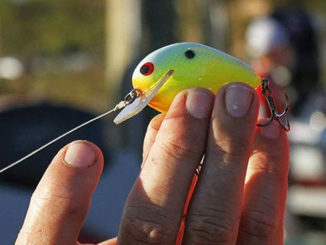 Jared Sattler prepares to release the 11.41-pound largemouth bass he caught Saturday afternoon back into Toledo Bend near Huxley Bay Marina on the Texas side of the reservoir. “He pulled up alongside me and opened the ice chest and he looked at me and said, ‘Son, she’s way bigger than 8,’” he said. 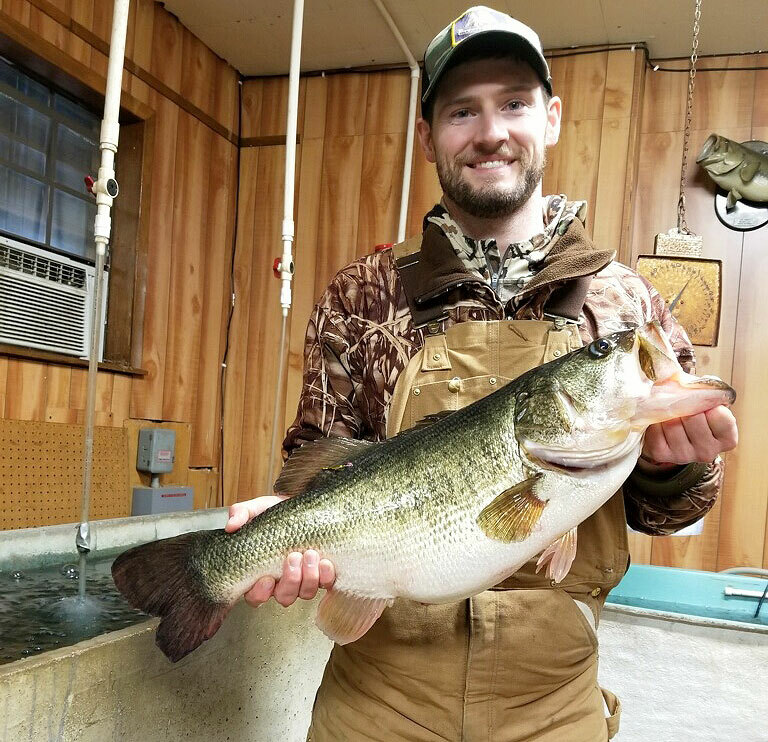 The big bass measured 26 inches long with a 21-inch girth, and is the 21st fish entered into the 2018-19 Toledo Bend Lunker Bass Program, which awards anglers who release double-digit fish back into the reservoir with a free replica mount. So the good news is Sattler reeled in the fish of a lifetime, and will have a complimentary mount to remember a very special day. The bad news is he’s actually allergic to fish slime, and he paid the price Saturday night.